The Coco collection features bold Swarovski pearls with Swarovski iridescent crystal accents. Let Coco move your look effortlessly from career to evening to jean comfort! The Coco necklace is a staple to one’s wardrobe, the classic pearl can be worn day or night and is something every woman needs to include in her jewelry wardrobe. 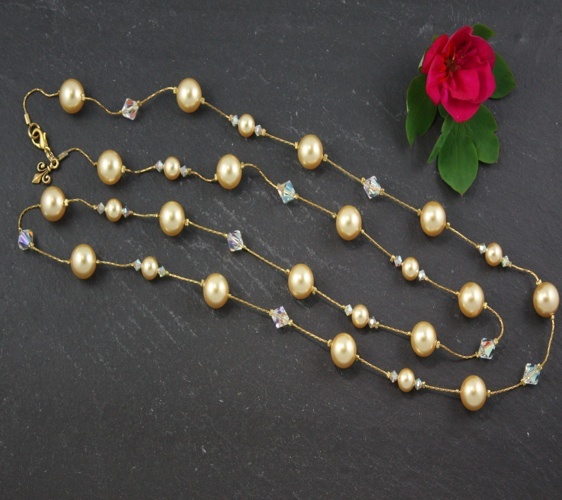 The Bright Gold pearl necklace a classic piece of timeless style. • Great bridal jewelry, bridesmaid jewelry, career jewelry, holiday jewelry, or just everyday! • Matching Coco earrings available, also coordinates with Grace earrings. • Length 45”, can be worn long or doubled up to give two different looks. "Fashion fades; only style remains the same,"- legendary French fashion designer, Coco Chanel.